There are serious concerns that governments are exceeding their ability to repay debts. Firstly, you have to be careful understanding all the different ways of measuring government debt. There are a bewildering array of different measures - see: Understanding Government debt statistics. Government Borrowing has shot up sharply around the world during the financial crisis and recession. This cyclical borrowing has highlighted long term structural debt issues. This is particularly problematic for countries with ageing populations, and rising pension and health care insurance. There is a risk rising debt burdens may cause investors to become unwilling to hold government bonds because of the risk of default. This scenario would cause widespread financial freezing. However, some countries with largest debt levels, still can borrow at relatively low interest rates, indicating markets still trust government borrowing. Countries in the Eurozone are more fragile to debt problems because they lack an independent monetary policy and ability to devalue exchange rate. Debt Maturity Levels. 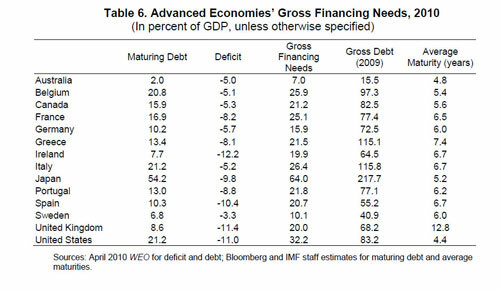 This shows how much countries need to borrow in the short term. E.g. UK has longest debt maturity ratios and so has to borrow correspondingly little in short term compared to US. The US has a gross financing need of 32% of GDP. The UK is 20%, Japan is 64% of GDP. Prospects for Growth. The rate of positive Real economic growth is vital for determining the prospects of debt to GDP. High growth reduces debt / GDP ratio without reducing primary budget. But, high growth automatically improves tax receipts and lowers spending. Countries with poor growth prospects (e.g. Greece tied to Eurozone monetary framework) will struggle to escape debt trap. What Happens if Greece defaults on debt?